Bryce Forry ’20 knows just how far undergraduate research can take you. 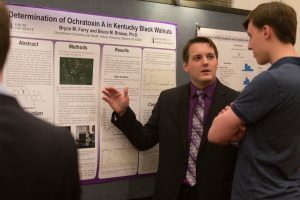 The biochemistry major worked as a student researcher under the guidance of Dr. Bruce Branan and presented his findings at Asbury University’s annual academic symposium SEARCH in 2018. SEARCH puts student researchers, like Forry, centerstage. The annual academic symposium poses an incredible opportunity for students who are interested in pursuing research in their future careers. Asbury undergraduates can submit and present their analyses in a variety of disciplines including English, history, mathematics, natural science and psychology. Any papers or independent projects completed at Asbury are eligible for entry. SEARCH 2019 will be held on Asbury’s campus on April 11. Forry’s initial experience presenting at SEARCH gave him the confidence to submit his findings for publication to the Proceedings of the National Conference on Undergraduate Research (NCUR) 2018. He also presented at the NCUR 2018 event last April. For Forry, participating in SEARCH was the gift that kept on giving. He’s thankful for the chance that SEARCH provided to work closely with his faculty mentor Branan who oversaw his project. SEARCH provides an excellent opportunity to dive headfirst into the world of inquiry, preparing students not only for the workforce but for graduate and doctoral level analysis work as well. “Since I plan to attend medical school and hope to perform research during my career, I was introduced to many fundamental research skills that I will continue to use in future work,” Forry said. Forry also cites his experience with SEARCH and the research skills he learned at Asbury as key factors in helping him obtain a laboratory internship in the summer of 2018. In addition to the great academic experience a student can gain from SEARCH, students will also have the opportunity to add a professional presentation to their resumes and work closely with their favorite professors. Equally enticing is the chance to win the $1,000 first-place prize, an increase from last year’s $600. Registrations and submissions are due April 1 at 5 p.m. This year, SEARCH will feature a scholars-leaders forum lunch, faculty panel discussion, faculty-scholars reception, keynote address by renowned philosopher Dr. James K.A. Smith and end with the student poster presentation in Kinlaw Library. SEARCH 2019 attendees can look forward to hearing from keynote speaker Smith, an author, philosopher and professor at Calvin College. His books include “You Are What You Love: The Spiritual Power of Habit,” “Desiring the Kingdom” and “How (Not) to Be Secular,” among others. He is a thought leader at the intersections of academia, society and the church. Smith also serves as the editor-in-chief of Comment magazine and his works are regularly published in Christianity Today, the New York Times and The Wall Street Journal. Students who are interested in participating in this year’s SEARCH competition can email Dr. Janet Dean at research@asbury.edu.